A number of local charities had an early Christmas when AXA XL made donations totaling more than $7000.00. 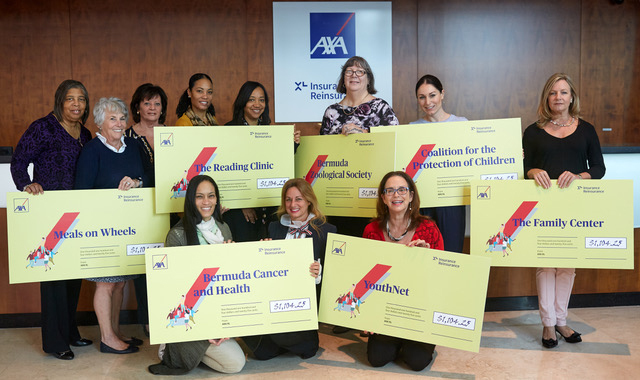 A spokesperson said, “AXA XL recently donated more than $7000.00 to Bermuda charities. The funds were raised through an internal sale of old branded merchandise. Employees who participated were asked to select a charity of their choice to receive the funds. [Back row] Karon Wolffe of AXA XL, Barbara Faiella of Meals on Wheels, Moira Lindo of AXA XL, DeAndrea Easton and Juliete Pearman of The Reading Clinic,Lynda Johnson of Bermuda Zoological Society, Kelly Hunt of The Coalition for the Protection of Children, and Alison Dodd of AXA XL. [Front row] Azuree Williams of Bermuda Cancer and Health, Lucy Monkman of AXA XL, and Clare Mello of YouthNet.